We have decided to discontinue PlannersWeb.com as a membership-based web site effective January 1, 2015. We do this reluctantly, but based on the fact that we simply are not generating enough revenue to justify continuing operations. As many of you know, we started our business in 1991 as the Planning Commissioners Journal -- the first national publication aimed primarily at citizen planners, including members of local, county, and regional planning commissions across the country. 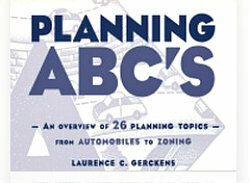 We transitioned from the printed Planning Commissioners Journal to the online PlannersWeb.com two years ago. We've enjoyed providing a wide range of content over the years -- content which we hope our readers have found of value. All current members of PlannersWeb.com will continue to have full access to the site at least until January 1st. We have not yet decided in what manner to make our content available after that date. If your membership is due to expire AFTER January 1, 2015, we will email you shortly with options on receiving a refund for the unexpired portion of your membership, or receiving an equivalent value in the form of copies of our popular print publication, Welcome to the Commission: A Guide for New Members. We will be continuing to post new content on PlannersWeb.com through December -- including the results of our recent questionnaire, which many of you responded to.